1 NVR PC Stick with Quad-Core Intel Processor delivering more horsepower than T1000. It does not include LCD, but it can be easily plugged into an HDTV or PC monitor for local CCTV-style live view. It also includes a full-size USB port, which you can connect a USB keyboard / mouse / USB hub. Note: The maximum number of cameras is dependent on your service parameters. Please contact our sales for more details. Video retention time: 7 or 15 days; 1, 3 or 6 months; 1 year. Share or publish cameras, access recorded files. Cloud CCTV NVR P1000 Solution is an all-inclusive Cloud NVR & CCTV solution. It integrates an NVR PC Stick running CameraFTP VSS software, 1 to 8 VGA indoor or HD 720P outdoor cameras, and one Wireless-N 300Mbps Access Point with CameraFTP's Cloud recording and surveillance service. The indoor cameras are preconfigured to connect with the NVR PC Stick via the Wireless AP. 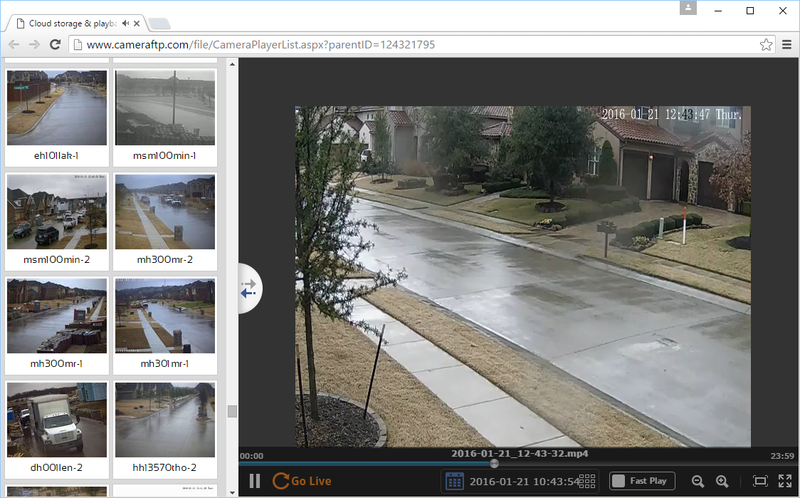 The VSS software on the NVR PC encodes the video stream into highly efficient H.264-based video clips and uploads them to CameraFTP cloud. The outdoor 720P cameras are physically connected to the WiFi AP through an Ethernet cable and PoE Injector/Splitter. The bundled cameras and cloud service plans are carefully chosen to strike a balance among video quality, bandwidth usage, hardware cost and service price. It can be customized to meet your specific requirements. Please contact CameraFTP support for more details. Live view or playback from anywhere on any devices. Includes a dedicated wireless router delivering superior security and signal strength. Since it is a pre-configured solution, it works out of the box. Please note that Broadband Internet Connection is required. 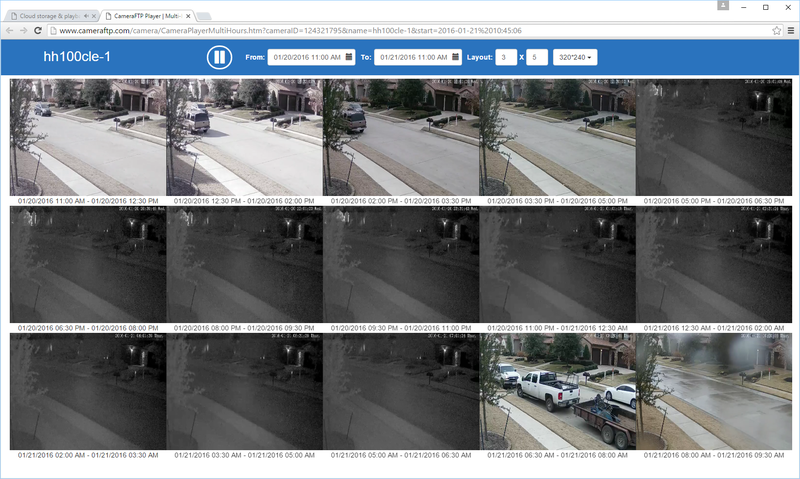 Power on your IP cameras. Your cameras are preconfigured to connect to the Wi-Fi AP wirelessly or through an Ethernet cable. They can automatically acquire an IP address via DHCP. It might take up to 1 minute. When it is connected to the Internet, the indoor camera's power light will turn solid green. Power on your NVR PC Stick. It is recommended that you connect it with an HDTV or PC monitor via HDMI. This way you can see the live view and the PC status. You need to press and hold the power button until you see the device is booting up, then release the power button. After it boots, it will automatically launch and log on to CameraFTP VSS software. The VSS software is responsible for encoding the video stream into highly efficient H.264-based MP4 clips and upload them to the cloud. You shall never turn off your NVR PC Stick or quit VSS unless you really want to stop recording. You can watch live views if you connect the NVR PC Stick with your HDTV or PC monitor. Launch a web browser and log on to www.CameraFTP.com, click My Cameras, you will see a list of your cameras. You can click on a camera to view it. Please note P1000 can be preconfigured to upload when a motion is detected or upload continuously. If you don't see any videos, please walk before the camera. CameraFTP will buffer the uploaded data for up to 1 minute, so it might take 1 to 2 minutes for the video to show up. You can easily move the wireless indoor cameras and NVR PC Stick around without needing to redo the cabling. The outdoor cameras use PoE, making it easy and safe to wire as you don't need to wire power cable. Scan the QR code below, or visit the App Store, Google Play store or Windows Store, and then search for "CameraFTP Viewer" to install our viewer app. Launch the CameraFTP Viewer app, log on to your CameraFTP account. After logon, you can see a list of your cameras. You can select a camera to view it live or play back the recorded footage. If your camera detects a motion, the system will generate an event. An alert will be sent to your smart phone if you have CameraFTP Viewer app installed. You can also view the events online in the Event Center. Cloud CCTV NVR P1000 Solution combines the advantages of an NVR PC Stick with Quad-core Intel CPU, wireless indoor / PoE outdoor cameras, dedicated 300Mbps Wi-Fi AP, CameraFTP VSS software and cloud service, it offers far more features than other DVRs. CCTV NVR P1000 is a bundled solution. Most features require an active CameraFTP subscription. This being said, the bundled devices are standard devices. It is possible for you to reconfigure the devices for other purposes. If you cancel your CameraFTP subscription, you will no longer qualify for any CameraFTP support. You also need to make sure that your cameras are no longer uploading data to CameraFTP. You can do so by resetting your IP cameras to factory state, or turning the devices off permanently. With our preconfigured solution, changing your service plan is generally not supported by CameraFTP. CameraFTP neither recommends nor forbids you from changing your service plan(s) by yourself. If you want to increase the retention days, you don't need to re-configure your device / software. Please contact CameraFTP customer support first. If you want to change any other service parameters, you must order a new service plan, and then cancel your current plan on www.CameraFTP.com. You will then need to reconfigure your cameras or VSS software, which defeats the purpose of "preconfiguration". In general, CameraFTP does not provide technical support on changing your subscription plan that is offered as part of a bundled solution. In certain special cases at our sole discretion, we may offer technical support on service upgrades, provided the customer is experienced in configuring software and digital devices and can effectively work with our tech support staff. If you want to add a camera to CameraFTP VSS, you can do so by manually adding a new IP camera to VSS. You must also order a new camera license on www.CameraFTP.com. Alternatively, you can contact CameraFTP support for more detailed instructions. The maximum number of IP cameras for CCTV NVR P1000 is dependent on your subscription parameters. CameraFTP CCTV NVR P1000 is a bundled solution, which is different from a conventional system purchased from a single manufacturer. Because CameraFTP does not manufacture the hardware bundled in our solution, these devices carry the standard hardware warranty from the device's manufacturers. The manufacturers' warranty information is included in the package you receive from CameraFTP. The device is kept in good condition and returned in the original box with original accessories. CameraFTP does not assume any other liability related with the bundled devices. CameraFTP will continue optimizing the devices that we include in our bundled solutions. We may change certain bundled devices from time to time in order to improve our service quality, add more features or lower the system cost. Note: Due to availability of hardware, not all bundled devices will be identical, however, the differences will be minor and will not affect the published system SPECs and Features. CameraFTP's software and service warranty is covered in our standard Terms and Agreement. Our service has been very reliable in the past. However, for regular users, the service and solution are offered As Is without any warranty. On normal operation, the TP-Link AP displays 3 green lights: the power light is solid green, the Wi-Fi light is green, and the Internet connection light is green and flashing. Note: There is a button to turn Wi-Fi on or off at the back of the AP. Please make sure it is on. The D-Link Camera's power light should be green and flashing, indicating it is connected to the network. If only one camera is not connected to the network, you can power it off and then power it on. If none of your cameras are connected, you need to restart the AP. To check the network connection status of the Windows tablet, you need to swipe on the screen from the right edge; it will then display the Charms Bar. You can then see your network connection status. Alternatively, you can tap on the Start button to go to the Start Screen, then tap on the Settings tile, which will open the PC Settings window. Tap on Network, you will see your connection status. If the NVR tablet is not connected to the network, but cameras are connected to the network, you need to restart the tablet. If neither the tablet nor cameras are connected to the network, then you need to restart the TP-link AP. 2. The live view does not work on the included tablet. Make sure your tablet is connected to the included TP-Link AP. If your tablet is far away from the AP, the connection may become unreliable. Move the NVR tablet closer to the AP. Make sure your cameras are connected to the included TP-Link AP. If a camera is far away from the AP, you need to adjust the location of the camera(s) and the AP. If your house is very large or if it has thick walls, the Wi-Fi signal may become too weak. In this case, you can use a range extender or directly connect the cameras with the AP using an Ethernet cable. 3. I can see the live views on the included tablet, but it does not upload any video to the cloud. The system is configured to upload only when it detects a motion. Please make sure there were some activities in the scene. The system may buffer the data for up to 1 or 2 minutes. 4. Camera live view worked fine before, but now it is unstable on the NVR tablet. If it worked fine before, you might want to reboot the affected devices. To reboot the wireless AP and IP cameras, you just need to disconnect the power adaptor, and reconnect it after 10 seconds. If it does not solve the problem, you can restart CameraFTP VSS software, or reboot the Windows tablet. The CameraFTP VSS software is responsible for encoding the video stream into highly efficient H.264-based MP4 clips and upload them to the cloud. You shall never power off the tablet or quit VSS unless you really want to stop recording. You must make sure that your CameraFTP account is in good standing. If you cancel your subscription, the service will stop working. Please also make sure that you pay your service fees on time. You can setup automatic debiting, or pay annually.